The first official game of the 2018-2019 NFL season was an exciting one. We witnessed the Super Bowl winning Philadelphia Eagles take on the Atlanta Falcons. And with playoff season here and the anticipation of the 2019 Super Bowl around the corner, hot wings, nachos, and kegs of beer are flowing. But before you dive into the platter of greasy foods, consider eating a little more like today’s modern athlete. When we first started working with professional athletes, I remember being at one of the team’s cafés. An Offensive Lineman walked up to the buffet, took an entire platter of fish, sat down and ate the entire thing – his serving size was our entire serving tray. That’s when I realized we need to approach the culinary and nutrition needs of athletes with an entirely different perspective. Depending on your role on the field, your dietary needs may include extra protein, low carb, high carb or vegetarian/vegan meals. And when it comes to fueling a team, the FLIK Hospitality team knows how to do it right. 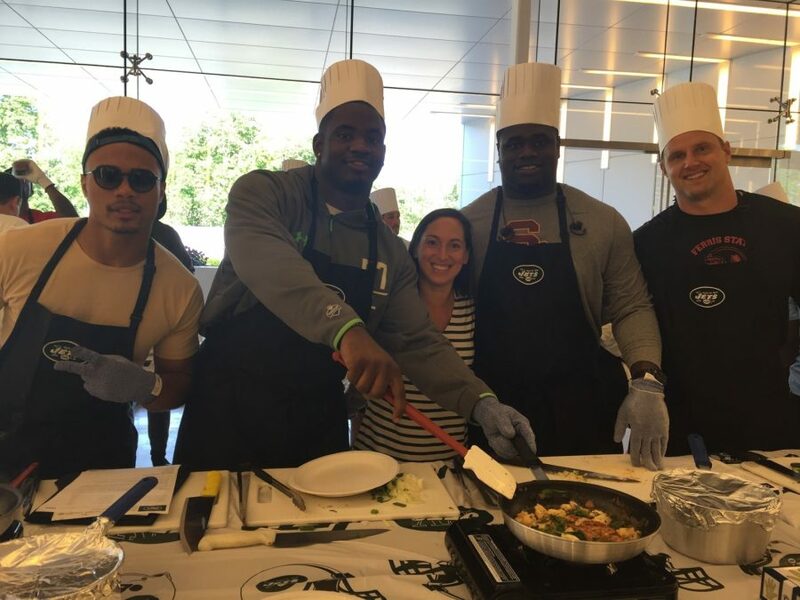 Starting with a Rookie Cooking Class, the newest athletes are introduced to our culinary style and offerings, and how to recreate meals at home. We infuse FLIK’s food philosophy of preparing wholesome, delicious food made with fresh, seasonal ingredients. We understand that knowing how to eat right and eat for specific performance nutrition goals doesn’t come naturally and nutrition education is a key element to transitioning from college athlete to NFL pro. When you work with several NFL teams, personalization – even beyond the nutrition aspect – is incredibly important. Nutrition, while critical to success for performance, isn’t everything. There must be balance. For each player, there’s some favorite cheat food that we try to keep on hand. For our athletes, the training facilities are their home away from home and we work to make the café as warm and welcoming as possible – including home cooked favorites. We really want to connect with what mom made, but with a healthier twist. From spicy gumbo from Louisiana, to cheesy baked mac n’ cheese, to Mom’s meatloaf and gravy, we aim to deliver the flavors from Mom’s kitchen, while ensuring we meet the nutritional needs to fuel each player throughout the day. At FLIK Hospitality, fueling the field is about personalization of our offerings and understanding the needs of every individual player. Just like being a player on the field, we must be nimble and adaptable to the environment around us. This is what makes us different - unique as a hospitality partner and what helps us fuel our players from pre-season to Super Bowl. Hosting your own football kick off party? Don’t forget to check out some of our Super Bowl-inspired eats from last year (Green Pea, Chickpea, Cauliflower “Meatballs” and Buffalo Chicken Blue Cheese Stuffed Avocados) or get inspired by the Eagles themselves and try this beloved recipe for Smoked Pork Belly Banh Mi. For more information about FLIK Hospitality or the FLIK Blog, please reach us at flikblog@compass-usa.com. To explore a career with FLIK Hospitality Group, please visit us here.